I mentioned, in my last post, an inspirational little book I just finished, Better Because of You by Ginny Hutchinson and Kathy Haffner. I am absolutely in love with this book and I hope you’ll soon have the opportunity to fall head over heels in love with it as well. This book is perfect for you if you…. Love inspirational books and writings. Love books that read very fast, leaving you more time for other things. Are looking for more peace and zen in your life. Are looking for more joy and happiness. Would like to have your life touched and enriched. Would welcome a ray of sunshine into your world. Okay, I could have said this book is perfect for anyone and everyone, but I had a few bullet points lying around and wanted to use them. This colorful, wonderful-natured, and fun little book is just a little over 100 pages. It’s not the sort of book that you get half-way through, put on the shelf and then have to force yourself to continue. Truth be told, it’ll never make it to the shelf. This is the sort of book you like to keep near you, just in case you need a uplifting quote, an inspirational shot in the arm, a soothing pat on the back, or a motivational kick in the behind. Believe me, you’ll find just what you need when you need it inside Better Because of You . I highly recommend this delightful book. Its positive outlook is contagious and it will give you a lift just when you need one the most. The gist of the book is to show the reader small, simple things they can do each day to make a big difference in their life… as well as in the lives of others. I love the thought of having a Visualization board. My oldest daughter recently put one together on a computer program (Paint), using pictures she rounded up online. What can I say, my offspring is as environmentally-conscious as I am. The book is filled with great tips and advice. Along with each tip, the authors include personal examples of individuals who have experienced the fruits of the tip. As you’d expect, these have as much of an impact on the reader as the tips do. The book also includes over 40 pages of inspirational and motivational quotes. They’re grouped by subject, so you’ll always be able to find just the inspiration you need, in just area you need it. Sort of like making sure you get the right shot in the right arm. There’s even a great (equally inspiring) website you can visit and take part in, http://www.betterbecause.com/. This book shows you how to make life just a little bit better in all 7 facets of your life. Authors Ginny and Cathy are successful Fortune 100 executives who wanted to make a positive difference in the world. Simply revealed are their 3 core beliefs based on the valuable (and humorous) lessons they learned in the corporate world, decades of marriage and raising children. 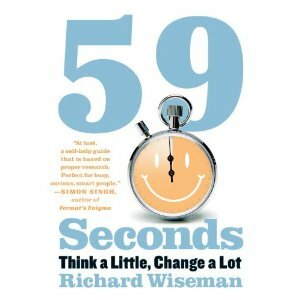 This book is essential reading for anyone looking for simple insights on leading a happier life. This book shows you how you, as one individual, can be an irresistible force for positive change. A portion of proceeds support Room to Read, a non-profit leader educating children in developing countries. I actually read the quote above during a lunch break last week while serving on jury duty. All of the jurors had spread out and gone to different restaurants but (you know me), I rushed across the street to a coffee house. I was sitting near a window thinking about this website that hadn’t been updated, that blog that needed a post, the laundry pile that could frighten small children, my cats who would surely sulk for a month, supper that wouldn’t make itself, and so on. After getting my Steak and Cheese Panini, iced tea, and coffee (yes, two sources of caffeine, don’t judge me) – I sat down and pulled the little book from my purse and began to pick up reading where I’d left off. The quote above is the first thing I read. I realized that I was very guilty of not relishing the moment I was in at the time – something that I normally excel in. I’m simply not the person who can be found living in the future or the past – for better or worse, I’m forever in the moment, trying to make it count double. However, a chaotic couple of weeks was beginning to turn me into a bundle of nerves – and a bundle of nerves doesn’t do anyone any good. The adorable logos above are available on BetterBecause.com – I obviously chose my own mantras, but there are plenty to choose from. You can have the logos printed on a number of products, including coffee mugs and tumblers. How cute are they? Order Better Because of You on Amazon today. A lot of things fascinate me. I guess I’m easily fascinated. And amused. I laugh often and easily, and sometimes at inappropriate times. I can’t help it, really, life and the livers of it simply amuse me. Attitudes. They determine so much, yet we tend to overlook and neglect them. Bad on us. I just finished an outstanding book, 101 Exercises for the Soul: Simple Practices for a Healthy Body, Mind, and Spirit by Dr. Bernie S. Siegel. In the book, Dr. Siegel offers 101 exercises that can, honestly, help transform your life. He starts off with a bang in precisely the right place – with our attitude. I believe this is why it’s so important to believe in yourself, your dreams, and your prayers. When you have the right attitude – a positive one – you’ll keep doing everything in your power to make your dreams come true. You’ll keep praying, keep believing, and your soul will lie its head on a pillow of Faith and cover up with a blanket of Hope. However, when your attitude is negative and pessimistic, you’ll all but give up. No one ever wins ANYTHING by giving up. Nowhere worth going – that’s where a negative attitude will take you, dump you, and leave you. 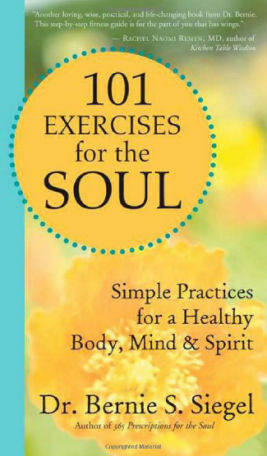 I highly recommend clicking the following link and reading more about this wonderful book: 101 Exercises for the Soul: Simple Practices for a Healthy Body, Mind, and Spirit by Dr. Bernie S. Siegel. It’s a very, very special book. Grab a copy, then sit down to transform your life. Be sure to have a pen and paper handy for exercises. You’ll really get in touch with yourself during these exercises. You’ll find wonderful qualities you’d forgotten you had! You’ll also uncover a few rotten habits you’ve picked up along the way. Don’t fret, though – Dr. Siegel will help you cast them aside! I’ll end with possibly my favorite passage from the book – again about attitudes and the importance of wearing the right one.